With winter break here, or almost here, you might be wondering how you will make it a month without seeing your friends every day. So, I am going to give you some tips on how to stay in touch with friends over break. These tips work for new friends you made this year or even friends that you made last year and are still friends with now. Some of these tips may not apply depending on where you live and where your friends live. Some of these tips might also be relevant or not based on how you prefer to keep up with friends. So, here it goes. This is sort of an obvious one, but in case you hadn’t thought of it, texting is a great way to keep up with people. You can also set up a group message so all of your friends can talk. There is Facebook Messenger, if you all have accounts on Facebook. You can also use apps like GroupMe or Slack, too. If you plan to use social media as a way to stay in touch, I would recommend you also use another method, like texting. Social media is great, but it can be really impersonal if all you rely on is your friends’ updates. If you don’t want to text, you can message friends through Facebook, through Twitter or Instagram’s DM’s, or even through Snapchat. If you just can’t go a whole month without talking to a friend, you can always hit them up on FaceTime or Skype. Video chatting can be awesome, because you can actually see each other’s faces. It can also be a lot quicker than texting, in a way. Texting can be done along with other things, but video chatting or even calling, requires your full attention. Now, this won’t apply to everyone, especially if your friends are scattered throughout the country. If you do live close enough to a friend or two, try and schedule a time to hang out over the break. You can hang out, go shopping, see a movie or anything else that you like to do. Yes, it’s a bit old school, but sometimes there is nothing better than receiving something in the mail. You could go the route of the travelling pants, or you could just write simple letters. Especially with it being cold, a letter can do wonders to brighten up your cold day. There’s no reason to stick to just one method of staying in touch. You can text, use social media, video chat and write letters. You could just do two or three things. 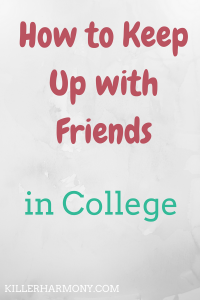 No matter where you will all be this break, I hope these tips gave you some ideas for keeping up with all of your friends. Winter break is an awesome time to get away from the stress of classes, but it can be hard to not see some of your best friends every day. So, have you kept up with long distance friends? How do you stay in touch? Let me know in the comments! Also, be sure to read my previous post and follow me on Twitter (@HannahHaefele) so you don’t miss future updates! Previous Previous post: Should You Start a Business?